At Creative Earthscapes, our passion is in creating the best possible outdoor living amenities for our Ohio clients. We take pride in our ability to handle even the most complex projects with relative ease -- thanks to our decades of collective experience in the industry. Our skilled people have worked on numerous outdoor improvement projects, and we have our online portfolio as proof. If you want to be sure that your investment will yield great results, then contact us soon. We promise to use our expertise in creating great outdoor living spaces to make your dream landscape come alive. We are serving Columbus and other nearby areas in the state, particularly Upper Arlington, Reynoldsburg, Lewis Center, and Grove City. There are several great perks that you’ll enjoy when your outdoor living areas are carefully planned and built. First is that you’ll have aesthetically superior outdoor features that can substantially make your property stand out. You could also maximize all available space in your outdoors, as well as ensure that all amenities are built to function perfectly. Careful planning and execution could also guarantee the sturdiness of all features, hence assuring decades of benefits. Five-year warranty – We are confident in our expertise, so we decided to throw in a limited five-year warranty on all our handled projects. This means that we will provide necessary repairs to any outdoor feature if we proved that it is due to our inefficiency. Fast project completion – We can complete most landscape installation tasks within two to three working days. 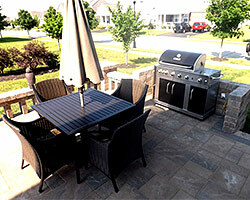 This means that you won’t have to wait too long to enjoy your dream outdoor living amenities. Premium materials – We have partners who provide us with the finest materials that we use in our projects. Such materials are made by the most trusted manufacturers, so clients are assured that they won’t be short-changed in terms of material quality. Certified masons and builders – Our skilled personnel are certified masons and builders so you are assured of quality workmanship. We are also a BBB-accredited company with an A+ rating. This means that you are dealing with a reliable contractor. If you want to have exceptional outdoor living amenities without breaking your bank, hire Creative Earthscapes today. Our company has created the finest outdoor features for countless Columbus clients, and we can surely do the same for you. 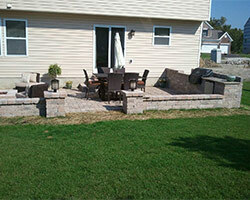 Call (614) 322-333 today, and let us make your dream landscape come true.